This essay aims to analyze the theoretical-conceptual production of one of the most influential Brazilian artists of the second half of the twentieth century, Hélio Oiticica. It is an effort in hermeneutics as well as an effort to follow Gilles Deleuze’s advice in The Logic of Sensation that we must listen “closely . . . to what painters have to say.” In the case of Oiticica, it is less a matter of listening than of reading attentively, seriously, closely, and theoretically the hundreds of pages of his copious, meticulous, rigorous, highly informed, and deeply original working notes, published essays, and articles—which were written as intensely and consistently as his “proper” artistic work was being created until his early death at the age of 42, in 1980. Thus, this essay takes seriously Brazilian critic Luciano Figueiredo’s assertion that “everything that Oiticica wrote is therefore an integral part of the body of his oeuvre.” Reading that integral part of his oeuvre, it becomes clear that much of what Oiticica wrote is aimed at an astoundingly rich production of concepts—particularly during the crucial period from 1959 to 1965, when he moved from his Metaesquemas (series of medium-size gouache on cardboard paintings usually featuring small monochrome squares or rectangles created between 1958 and 1959) to the definitely participatory tridimensional devices he called Parangolés (precarious capes and banners made out of multicolored fabric, canvas, plastic bags, string, and so on, and that had to be animated by the wearers’ action and dances, particularly samba). Contrary to the quite modernist partition that Deleuze and Félix Guattari perform in What Is Philosophy, when they distinguish art from philosophy by stating that the former is dedicated to the creation of “percepts and affects” while the latter is dedicated to the creation of “concepts,” my aim is to insist on the extraordinary philosophical production of concepts by Oiticica during the first half of the 1960s. I agree with art historian and curator Catherine David when she affirms that Oiticica’s oeuvre, including his theoretical-critical production, constitutes a “permanent inscription of a radically critical thought and action within Brazilian culture and modern art.” And I follow Brazilian psychoanalyst and art critic Tania Rivera’s recent statement, in the introduction to her book Hélio Oiticica e a Arquitetura do Sujeito (Hélio Oiticica and the architecture of the subject, 2012), that the urgent task for art history today “is to think with Hélio. . . . He was a tremendous thinker: theoretician, critic, poet.” It is then toward Oiticica’s thought-in-action, his “actioning” of thought through the problematic field brought about by art and its matters, and most particularly by the time that artworks produce in their complex relations to social and political matters, that this essay, perhaps too obsessively, turns. My aim is to contribute to a theory of temporality in experimental twentieth-century art by explaining and also expanding some of Oiticica’s key concepts, starting with the intriguing concept of “color-time.” Therefore, for more detailed descriptions and/or images of Oiticica’s works, I must refer the reader to other sources. Good quality images of most of his oeuvre can be easily found online; the Projecto Hélio Oiticica website provides facsimiles of the vast majority of Oiticica’s handwritten notes and typed texts, all cataloged and indexed; and, finally, several excellent catalogs of his work are available, as well as recent English translations of his texts. Particularly beautiful is the exhibition catalog The Body of Color, where reproductions of all the works invoked in this essay can be found. Even though those sources provide but weak representations of the works, they do give a general idea of what Oiticica was after in art, life, theory, and politics. As already mentioned, in the following pages, I will pay particular attention to Oiticica’s experiments with, and theorizations of, color and time conducted between 1959 and 1965. Oiticica’s critique of time departed from his expressed desire to investigate what he called “the problem of color and the sense of color-time.” Indeed, the development of the concept of “color-time” is the key problematic informing Oiticica’s theoretical and artistic works throughout the whole year of 1960. It informed the compositional mode of several of his sculptures and installation works until the mid 1960s—including his Spatial Reliefs (1959), Penetrables (1959–63), and Bólide (1963–80). 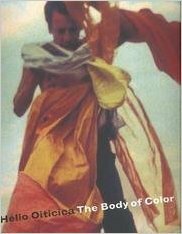 This essay analyzes the approach of Brazilian artist Hélio Oiticica (1937–80) to what he called “the problem of color.” Oiticica’s conceptual-aesthetic pursuits between 1959–65 offered a renewed onto-political conceptualization of notions of time, particularly of the “liveness” of inert matters and of the “thingness” of participation. His notion of “vivência estética” (the lived experience of the aesthetic) bridged supposed gaps between performance and objecthood while offering a redefinition of what constitutes political action and what constitutes artistic matter. ANDRÉ LEPECKI is Associate Professor in Performance Studies at New York University, an independent curator, and an essayist. He is the editor of several anthologies on dance and performance theory and author of Exhausting Dance: Performance and the Politics of Movement (2006) and Singularities: Dance in the Age of Performance (2016), both published by Routledge. Join a time-based (and time-sensitive) tour of Mind over Matter at the Berkeley Art Museum with curator Constance Lewallen. Converse with Shannon Jackson and Julia Bryan-Wilson about their special issue of Representations, “Time Zones: Durational Art and Its Contexts,” including substantive essays on contemporary Croatian dance practice, Uruguayan art under dictatorship, the work of the Brazilian artist Helio Oiticica, and the visual and sound arts of China, along with reflections on durational art by Berkeley faculty, including Natalia Brizuela, Jeffrey Skoller, Suzanne Guerlac, Winnie Wong, and more. 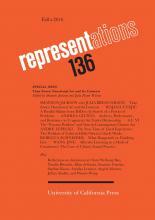 Engage with the Arts Research Center’s new online anthology of keywords in contemporary art and performance, In Terms of Performance, coproduced with Paula Marincola and the Pew Center for Art & Heritage, with contributions from a range of Bay Area artists, critics, and curators such as Rudolf Frieling, Paul Dresher, Judith Butler, and Claudia La Rocca. Launch the holiday season with a celebration of the Arts Research Center as a think tank for the arts, at Berkeley and beyond. See the full afternoon program here.